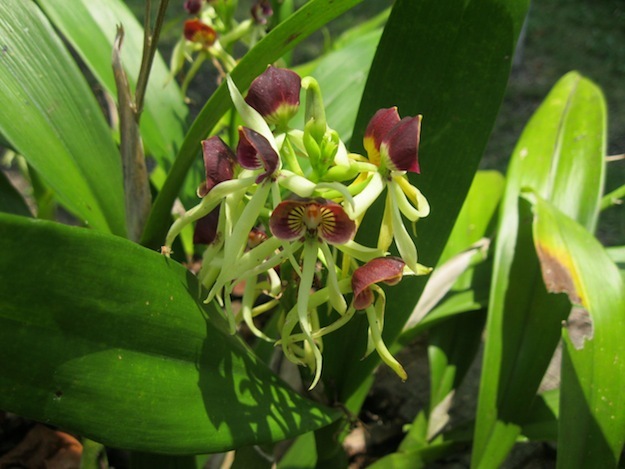 Black Orchid: the national flower of Belize, and the name of our riverside resort. The black orchid blossoms are so small, at first glance I thought they were spent. Barely bigger than my thumbnail, these show a deep maroon color. We’re in a hotel of the same name. The Black Orchid Resort is about a half hour from Belize City and lies along the Belize river. These flowers were spotted on the New River, where we toured the Lamanai Maya ruins. The great day trip was set up by the hotel and by Lamanai Ecotours. Six of us were treated to a 25-mile river trip to the ruins, spotting crocs and turtles, hawks and kingfishers, bats and flowers and more, with the expert help of our guide, Carlos. See more photos at Travel Past 50. This post was added to a Blog Hop on December 6, 2013. Your photo has inspired me to know what blog post to link to for the Blog Hop! Hint: Orchids. Excellent, I’ll be looking for it. Absolutely gorgeous flowers and a wonderful area to spend time in. Hey Geogypsy, Thanks for the comment. We didn’t want to leave this place…but eventually headed to the “ATM” Caves near the Belize/Guatemala border. Have you been there? What a beautiful and exotic blossom!